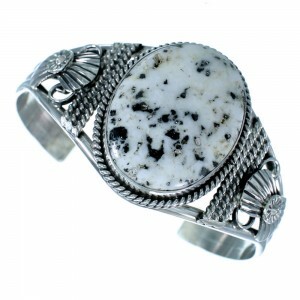 Sterling silver and real White Buffalo Turquoise. 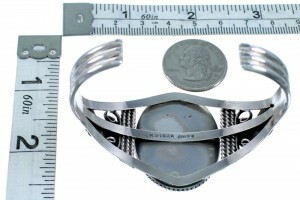 The inner bracelet circumference measures approximately 5-1/2", plus a 1-1/4" opening, and 1-1/2" at widest point. This gorgeous bracelet is absolutely distinctive in each and every way! 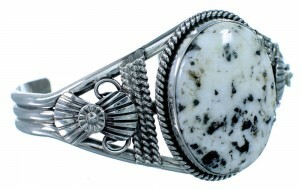 This piece of Native American jewelry is Navajo hand crafted by artist Mary Ann Spencer, out of genuine sterling silver and a real White Buffalo Turquoise stone. 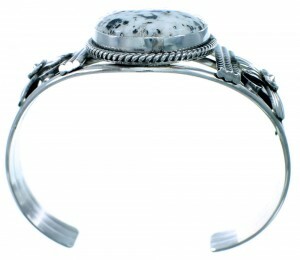 The stone is carefully placed in a hand cut bezel setting, while being accented by mini silver beads and hand crafted silver work for a magnificent look. 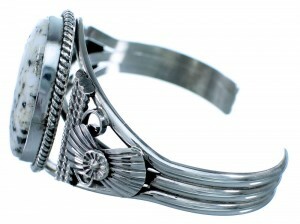 THREE silver bars make up the cuff and complete the bracelet to perfection! The bracelet stamped sterling and hallmarked by the artist.